By William Mackay: It was thought previously that IBF/WBA light welterweight champion Amir Khan would be facing a quality welterweight like number #2 ranked WBO contender Kell Brook in Khan’s warm-up fight at welterweight (147 lbs) before possibly getting a money fight against unbeaten WBC welterweight champion Floyd Mayweather Jr. next year. However, it looks as if Khan is going to safe route by targeting fringe contender Matthew Hatton (42-5-2, 16 KO’s) instead of someone who can punch and has good speed. If Khan thinks that fighting Matthew Hatton is going to get him ready to fight guys like Mayweather, Andre Berto, Victor Ortiz and Mike Jones, he’s really kidding himself. Hatton has no power is pretty much a bigger light welterweight but without the power that goes along with the weight. This is a terrible fight, but also one that is so predictable. I knew it would never happen when Khan was mentioned as wanting to fight Brook before getting his payday fight against Mayweather. That would go against the type of safe fights that Khan has been put in with since he went life and death against Marcos Maidana last December. Hatton, 30, was soundly beaten when he stepped it up against a quality fighter Saul Alvarez last March, losing by a lopsided 12 round decision in a fight where Hatton took one-way punishment for the entire fight. Hatton got a lot of credit for soaking up punishment, but that’s really the only thing you can give him any credit for. He beaten little known fighter Andrei Abramenka by a 12 round decision in his last fight in August. Most of Hatton’s career wins have come against 2nd and 3rd tier opposition. His best win of his career was against former WBA interim welterweight champion Yuriy Nuzhnenko in July 2010. 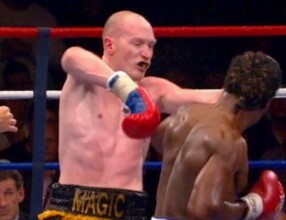 Hatton has to beat Israel El Massoudi in his next fight.